My little brother’s slippers had holes in them. 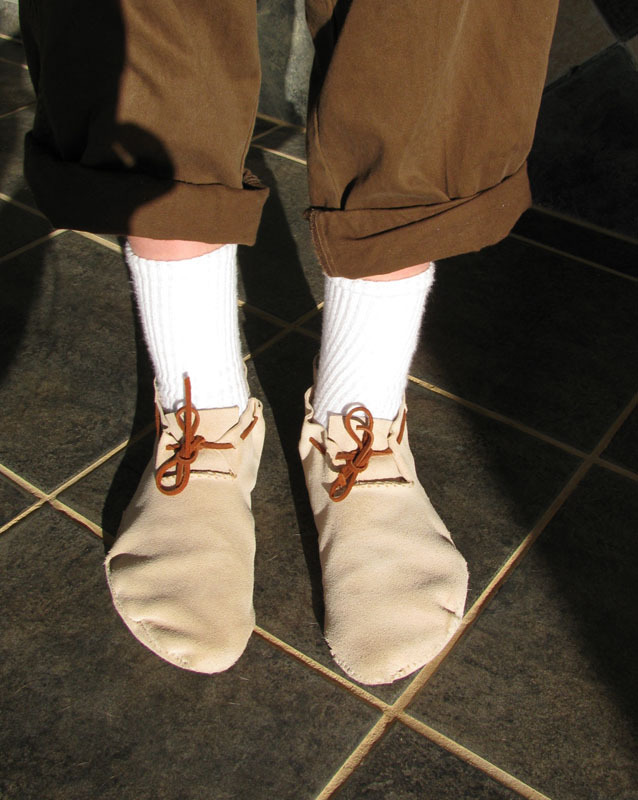 He likes to take his shoes off at the door and wear moccasins all day long, and he had worn through his $17 slippers. “We could make you some moccasins,” I told him. He was excited at the idea of a project. Before going home for Thanksgiving break, I had to locate some leather, needles, thread, an awl, and patterns. I write this post mainly because I relied on online sources, and trying to live the gratitude that Fr. Joel suggests I feel I should contribute to the online knowledge. We decided on plains Indian style moccasin. A single piece of leather goes under the sole, and is folded over the top of the foot and sewn on one side. Following some directions, I took a tracing of the foot and then added 3/4 inch behind the heel and 1/4 inch around the toes. 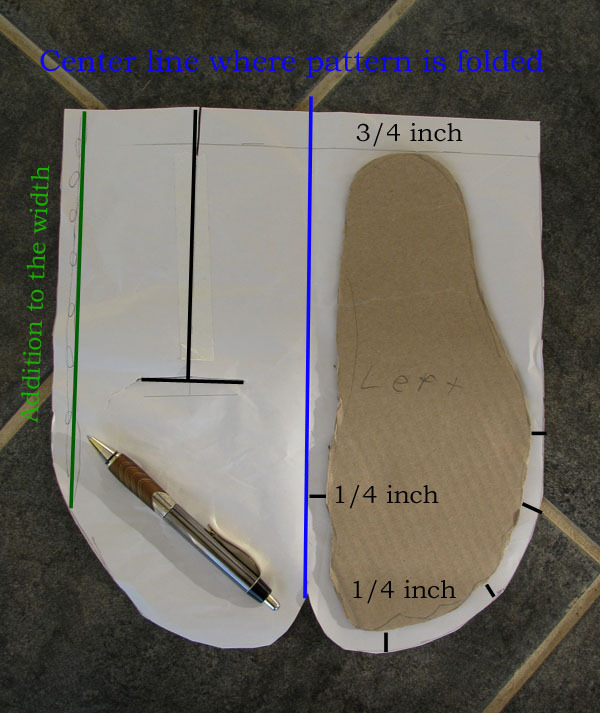 From the widest part of the foot, the pattern goes straight back to the heel. The upper was a mirror image of this. The problem was, this pattern DID NOT FIT. It was too small. After thinking about the problem, I measured the CIRCUMFERENCE of the foot and added to the upper until it equaled the total circumference (in the picture the addition is marked with the pen). Pictures of these moccasins suggested that the upper was, in fact, a little larger than the sole. After figuring out the pattern, the project went quickly. I punched holes with the awl and my brother did the whip stitch. We had to adjust the stitching to take up the difference in size between the upper and the sole. Then we cut a hole in the top (marked by the upside-down T in the pattern), cut a little flap at the base of the heel, and sewed up the back of the moccasin. The stitching was done with the moccasin inside out so the seams wind up inside. These moccasins are made of cow hide suede, which is flexible but durable. It seems to have less give to it than dear skin. 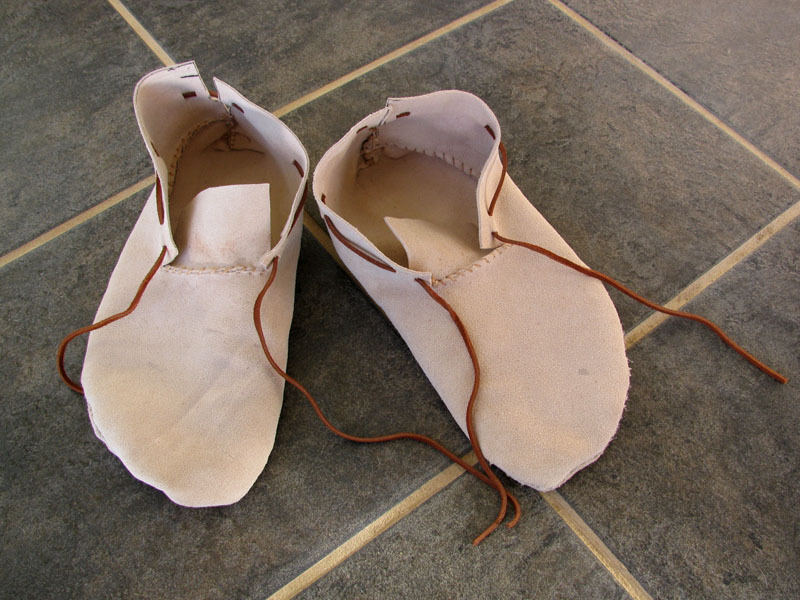 We finished the moccasins by sewing a small tongue into the opening in the upper, and threading laces to hold them on. It was a fun project and it was good to accomplish something with and for my brother. I made a larger pair for myself, and have been enjoying them around the house. I always wear them with socks, since the seams are on the inside and they irritate my foot if I don’t. Now, my mother is talking about slippers for Christmas; looks like I might have one gift figured out.